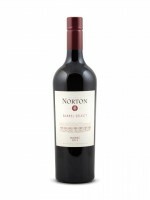 Barrel Select is an entry level label from Norton, a winery that delivers a range of noteworthy wines across its portfolio. A mix of barrel and tank aged Malbec contribute to this spicy and fruity red wine. A nice barbecue option, this has fresh fruit intensity, drying tannins and some modest complexity that make it a solid pizza, pasta or burger red.